The apricot is a plant which is grown in Central Asia and around the Mediterranean. Apricot kernels are rich of healthy fats, fibber and iron and similar to other types of nuts. They are used for direct consumption in roasted form or by extracting oil from them. Sweet apricot kernels enhance immunity. The content of amygdalin and its anticancer effect still controversial issue. It is considered that the amygdaline spread throughout the body and can fight cancer cells without harming the body before becoming cyanide. Femenia et al., , were establish the fat content 53%, sugars 7%in sweet apricot kernel and 43% fat, 14% sugar in a bitter nuts, content of oleic and linoleic acid in summary 92% from total fatty acids content. The distribution of fatty acids in apricot kernels is oleic — 74.59%, linoleic -19.57%, stearic — 0.96%, palmitic -4.11% palmitoleic — 0.59% and arachidonic acid -0.18%. Ozcan et. al., , were found different yield of oil from apricot kernel in the range from 42 to 57%, crude fiber from 4 to 7%, protein from 15 to 24%. The main representatives of the fatty acids in apricot kernels are oleic (53-70%), linoleic (21-35%) and palmitic, which make them an important source for food industry and other industrial production [3, 6, 7]. Similar results for fatty acid composition in wild varieties of apricots kernel were obtained from Kaya et al.,  and Gupta et al., . The objective of this study was to determine the fatty acid composition of apricot kernels from five varieties of apricots grown in Bulgaria. Apricot plants are the following sorts- Krasnoshteki, Early Orange, Silistrenska kompotna, Modesto and Hungarian best apricot grown on the area of the Experimental Station of Apricot and Agriculture in Silistra town. The extraction of the total lipidswas performed by the method of Bligh&Dyer (1959)  by chloroform and methanol in ratio of 1:2. The methyl esters of the fatty acids were analysed using gas chromatograph Shimadzu-2010 (Kyoto, Japan). The analysis was carried out on a capillary column CP7420 (100 m x 0.25 mm i.d., 0.2 m, Varian Inc., Palo Alto, CA), with carrier gas- hydrogen and make-up gas- nitrogen. Is programmed furnace regime of five steps. 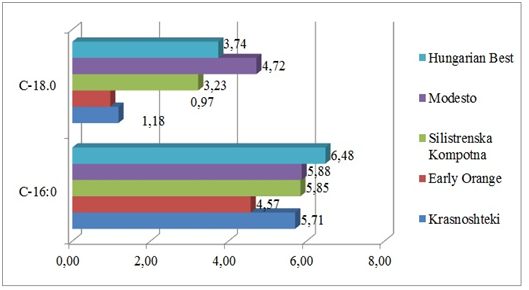 The oil from different varieties of apricot kernel were obtained is rich of monounsaturated and polyunsaturated fatty acids and poorly of saturated fatty acids (Figure 1).The high content of monounsaturated fatty acids from 54,96 (Early Orange) to 63.15 (Krasnoshteki) g / 100g fat, caused by the high content of oleic and vaccenic acid, and that of polyunsaturated fatty acids (from 25.62 to 38, 67 g / 100g fat), the main representative gamma- linolenic acid. Vegetable oils are poor in saturated fatty acids and therefore their content in kernels of different varieties of apricots ranged from 5.71 in Early Orange to 11.62 g / 100g fat in Modesto, conditioned by palmitic and stearic acids. Saturated fatty acids in the analysed apricot kernels are presented primarily of palmitic and stearic acids, while the other representatives of this group are below 0.1 g / 100g fat (Fig. 2). Palmitic acid has the highest content in the kernels of apricots variety Hungarian Best- 6.48 g / 100g fat and the lowest content in sort Early Orange, while stearic acid accumulates most in variety Modesto- 4.72 g / 100gfat and at least the Early Orange- 0.97 g / 100g fat. Of monounsaturated fatty acids, oleic acid and vaccenic have a relatively high concentration, while the others are in trace amounts below 0,15 g / 100g fat. In Figure 3 are presented the concentrations of gamma linolenic, vaccenic acid and oleic. Gamma linolenic acid in the studied oils from different varieties of apricot kernel has the highest concentration in cultivar Early Orange – 32.66 g / 100g fat and lowest in sort Hungary Best -25.16 g / 100g fat. Vaccenic acid in the analyses kernels from different varieties of apricots varies from 1.19 to 1.63 g / 100g fat. Oleic acid in apricot kernels variety Krasnoshteki have a highest value 61,48 g / 100g fat, while Early Orange’s lowest- 53,49 g / 100g fat. Apricot kernels are a natural source of biological active fatty acids of the omega-6, cis and trans isomers of oleic acid (Figure 4). Omega- 6 fatty acids ranged from 25.62 g / 100g fat Hungarian Best variety to 38.59 g / 100g fat in Early Orange. Omega-3 fatty acids in all varieties of apricot kernels are below 0.10 g / 100g fat. 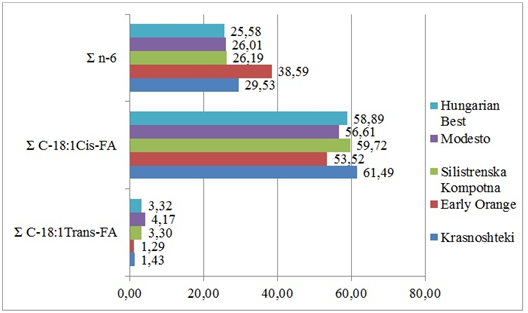 Cis isomers of oleic acid in variety Krasnoshteki- 61.49 g / 100g fat and Silistrenska Kompotna – 59.72 g / 100g fat have a highest concentration, as long as in Early Orange the concentration is lowest — 53.52 g / 100g fat. The apricot kernels from varieties Silistrenska Kompotna, Modesto and Hungarian Best are characterized by a high content of natural trans fatty acids, respectively 3.30, 4.17 and 3.32 g / 100 g fat, whileKrasnoshteki and Early Orange have low concentration of trans fatty acids as follows 1.43 and 1.29 g / 100 g fat. Regarding the accumulation of saturated fatty acids in kernels of different varieties apricot most suitable for human consumption is sort Early Orange. The kernels from Modesto variety is well retained content of vaccenic acid, as long as, Early Orange with oleic acid. Apricot kernels are rich of healthy fats, fibber and iron. The objective of this study was to determine fatty acid composition from apricot kernels of five varieties apricots grown in Bulgaria. Apricot plants are the follow-ing sorts- Krasnoshteki, Early Orange, Silistrenska kompotna, Modesto and Hungarian best apricot grown on the area of the Experimental Station of Apricot and Agriculture in Silistra town. Regarding the accumulation of saturated fatty acids in kernels of different varieties apricot most suitable for human consumption is sort Early Orange. The kernels from Modesto variety is well retained content of vaccenic acid, as long as, Early Orange with oleic acid.